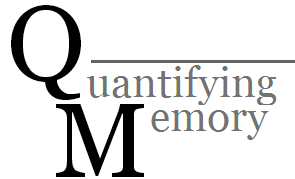 Recently I wrote up a piece about quantifying memory and news, and proposed that two distinct linear models might be the way to go about it. 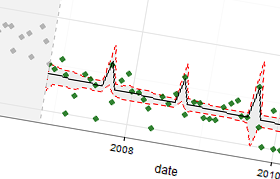 However, the problem with linear models is they by their nature don't take into account the ways in which trends may be non-linear.They also lead to nonsense predictions, such as negative values. Notice in the above table how the anniversaries variables exceed the explanatory power of the news and date variables. This indicates that by the end of 2006 Beslan was increasingly featuring as a memory event and less as a news story. Also notice how the remaining deviance is quite large - this model apparently fits the data less well than the model for the entire data (it explained 85% of the deviance), but this is due to the original estimate being biased by the accurate prediction of a few outliers.